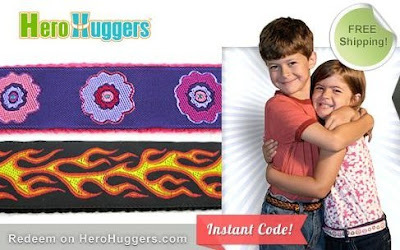 $13 for $30 to Spend on Kids Belts + FREE Shipping! Get up to 3 Belts for $13! For a short time at DealPulp, you can get $30 worth of kid's belts for just $13, plus get free shipping with the deal! The belts will come from HeroHuggers.com. I checked out the site and belts start at just $9.95 for solid colors. So you could get 3 belts for your $13, which is a great deal! Or if you'd rather, they have belts with nice designs for $14.95, so you could get two of those. Choice is yours! You'll be able to use the code immediately after you purchase it...no waiting around to redeem a voucher!